We're back with more easy art projects for kids, an on going series with some of the most creative bloggers around. So far in this series we've made homemade paint brushes while exploring string, erupting watercolor absorption art while exploring with watercolors, tape resist art on foil while exploring resist art, and melted crayon art in the glue gun while experimenting with crayons. The theme for today is exploring chalk. I wanted to think outside of the box, so I set up an art activity with ice chalk as made popular by Reading Confetti. 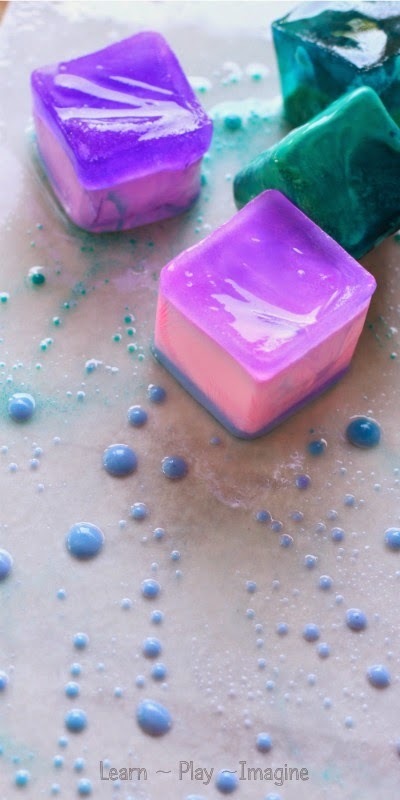 I made the ice chalk exactly the same way I always make sidewalk chalk paint, and then I poured it into ice cube trays to freeze. 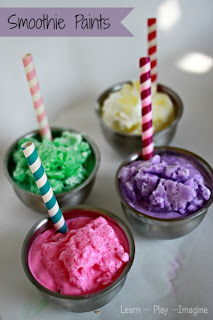 Combine equal amounts of cornstarch and water and add as much color as you'd like. I prefer liquid watercolors over food coloring, because not only are the colors more rice and vibrant, the watercolors wash off of clothing and hands easily. I left the ice chalk to freeze overnight. The next morning I set up an easy art invitation with paint brushes, ice chalk, and oil. I instructed the boys to cover their paper with the oil first. I used a cheap vegetable oil that we use only in play and art, and I save the good cooking oils for food prep. I used watercolor paper for this art project, although any thick paper will work. Avoid thin paper since it will tear easily when it gets wet. JZ (6) was the first to finish painting with oil, and he excitedly reached for a piece of ice chalk and started rubbing it over his paper. He was completely awed by the beads of color that didn't spread. He thought it was so cool. We've been doing many water science experiments lately, and this was a great way to demonstrate how water and oil do not mix. J-Bug (5) usually walks to the beat of a different drum. He is my creative, out of the box thinker. He wanted to paint with the ice chalk first then cover it with oil. His unique method produced gorgeous results. I love that he isn't afraid to think outside of the box. Tank and Peanut (32 months) really focused on the sensory aspect of this art project. and moving on to the frozen chalk. Please note, oil can stain clothing, but with proper care it washes away easily. Here are tips for messy playas well as laundry tips to avoid stains and keep clothes bright. A little Dawn dish soap will go a long way to get oil off of hands, play areas, and clothing. Regardless of the chosen method, painting with ice chalk and oil produces gorgeous results. Once dry, the colors have a soft, chalk look and feel. For more easy art projects for kids follow me on Pinterest. This is such an amazing idea! WOW. I would love to try this this summer!! 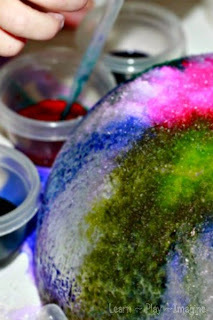 What beautiful results and a fun way to experiment with oil, water, and color! I'll be sharing on The Crafty Crow soon! 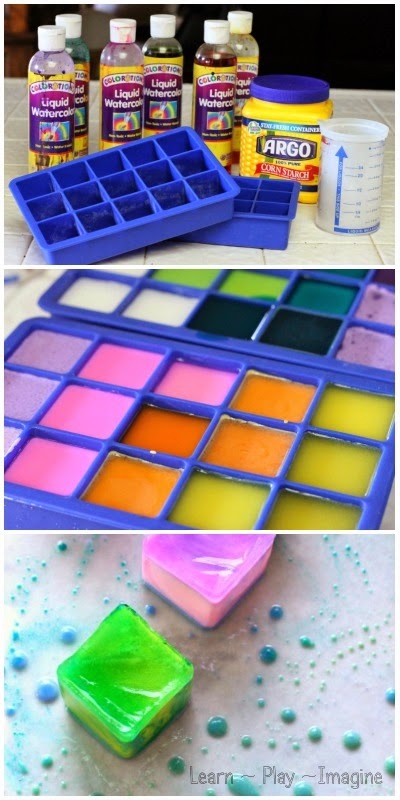 question - do you combine two colors in the ice cubes to get them to blend like that?